The chafing dish is usually adopted when there is no maid in attendance, and, because of this, food for the entire meal is often placed on the table at once. The first course is in position when the guests are called to the table, the chafing dish, with ingredients, is set in place, with a pile of serving plates beside it. 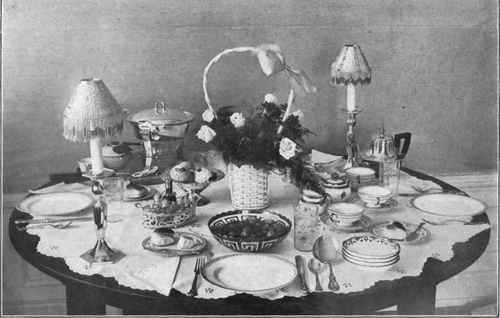 The salad, arranged on a platter or in a bowl, is set at the place opposite, the plates being at the left of it while the dessert (unless an ice) is served individually, and set at the right of each guest; the'hors d'oeuvers and plates of sandwiches, cake, etc., are set where it is convenient. Extra butter and a carafe or pitcher of water are also on the table, while the service for coffee, tea, or any other drink to be served is arranged on a tray and set either before one of the guests, or stands in readiness on the buffet for the hostess. After the chafing dish has been removed tea or coffee is usually made at the table. Table Set For Informal Chafing Dish Supper. If a chafing dish luncheon is being given and a maid is in attendance, the ingredients and plates are brought in by the maid. The hostess serves directly to the plates which are passed by the attendant. In cases where a maid is not employed the menu should be simple, the first course being in position when the meal is announced, the second consisting of the article that is to be prepared. In this case it is permissible to have the chafing dish on the table from the first, although it should be removed with the soiled dishes after the course is finished. To be successful a chafing dish affair should not include more than ten guests - in fact six is a more convenient number - for the chafing dish has not been made that will serve more. If a larger group is to be accommodated, the tables should be enlarged, and a friend invited to preside over a second chafing dish. A study of the chapters in this book which are devoted to left-over meats, eggs, cheese, souffles, vegetables and fish will suggest many dishes that can be easily made in the chafing dish.